The hardest part of being holistic is finding a balance between Eastern & Western Medicine. You have to be able to put your ego aside & objectively look at each situation & do what is best for the body so you can live in optimum health. Much like the decision to vaccinate your child, you have to look at each illness you face & evaluate if you need Western Medicine or if there is a holistic approach. Knowing that I can’t holistically fight Polio, I vaccinated my child against it. My goal is to use as few pharmaceuticals as possible but to know when the holistic approach needs to reach for the hand of Western Medicine. As long as I do my share to try to prevent illness/disease and don’t abuse Western Medicine then I feel okay using it when I see fit. I don’t reach for an Advil or pain pill for aches & pains because I know a holistic approach works better in longevity. I don’t use an Antibiotic every time I’m sick but I do know when to say when like when Bronchitis is moving it’s way to pneumonia, antibiotics are necessary because my eastern approach needs a hand. I think the issue facing and caused by Western Medicine is our abuse of it. Instead of living a healthy lifestyle & eating to prevent disease, most people live a lifestyle & eat a diet that causes disease; forcing Western Medicine to virtually keep them alive. Having to create pills to control cholesterol, blood pressure, circulation, blood sugar, erections, consistency of our blood along with surgeries to control weight, remove fat, unclog arteries and the list goes on and on. These all being things you can prevent & control holistically. My wish is for each person to do their share, create health in their lifestyle & within their body without abusing pills & surgeries, allowing Western Medicine to focus on research for the unknown instead of fixing mans created health epidemics. 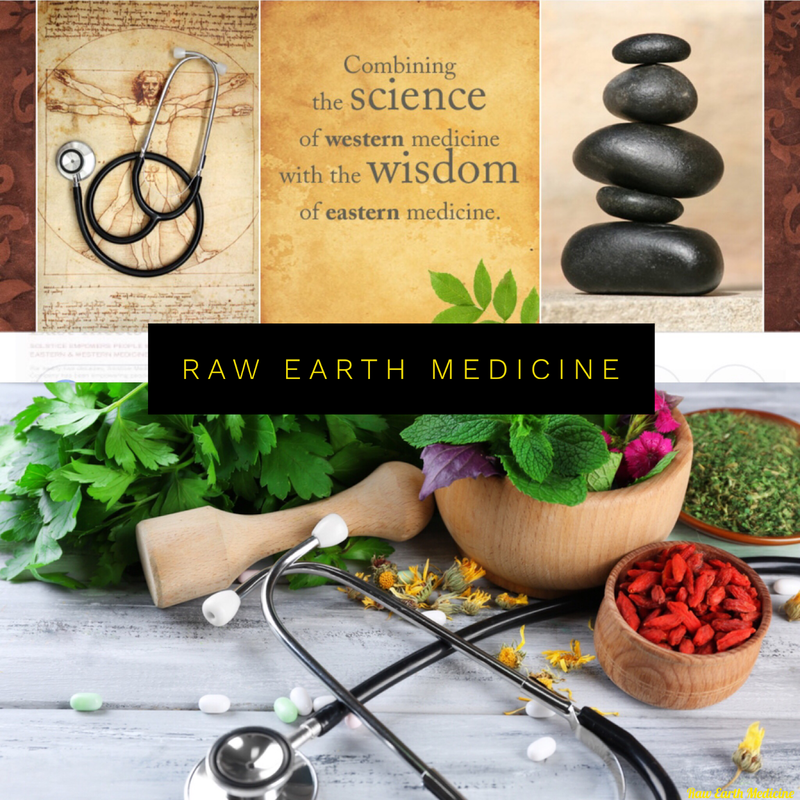 The goal should be Raw Earth Medicine a balance between Eastern & Western Medicine, each holding tho others hand to keep you living a long healthy life!